If you are a curly then you’ve probably already heard of keratin treatments. They are different from relaxers but aside from that, how much do you really know? Many, including my daughter, have tried it with much success and loved it. In a natural nutshell, a keratin treatment is not the big bad relaxing wolf, but rather a good alternative to smooth out your curly tresses. Keratin treatments are a semi-permanent hair smoothing system and not a straightener! They infuse the hair with keratin protein to keep it smooth and protected. Once the keratin treatment is applied, then the hair is straightened with a flat iron to seal in the treatment. Again, it does not straighten the hair but rather smooth it out and make straightening easier. They will allow you to straighten your hair quicker and easier while eliminating frizz. Yes, that means in humid climates as well. Calm down curlies, it’s only temporary ladies! Now, with any process done to the hair there is upkeep and one major component is using the right products to maintain the treatment for as long as possible. One priority component is using the correct shampoo, a keratin shampoo that is specifically formulated to extend the life of your treatment. Using a regular shampoo will only quickly wash away your treatment, and your money will go down the drain with it. 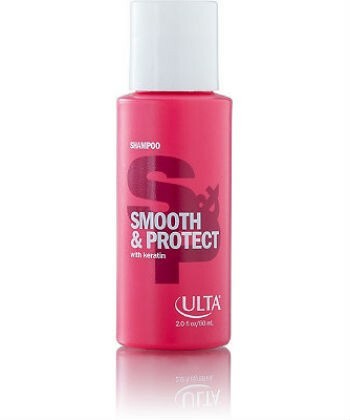 This smoothing shampoo was formulated to keep your tresses nourished, shiny, and smooth. It’s a high-performance shampoo that restores your hair’s keratin that gets lost during daily styling and color treatments. This sodium chloride and sulfate-free shampoo is fortified with keratin, soy, and wheat proteins to extend the vibrancy of color-treated hair. It contains mild surfactants that remove dirt and build-up without stripping your color. This shampoo was created to provide gentle cleansing and not diminish the necessary nutrients in your tresses. Formulated with keratin protein to provide lasting protection, this shampoo is great for dry, damaged, or over processed hair. Created with a patented formula JUVEXIN that shields each strand from damage, this special shampoo is very hydrating. Because it is formulated to be sodium chloride-free and sulfate-free, it is safe for color-treated hair and will leave your hair shiny and soft. This gentle cleanser full of keratin will improve the strength in your tresses while adding shine and manageability. It will bring moisture to your strands and reduce frizz as it protects your hair from sun damage. The Brazilian cocoa nut oils and hydrolyzed keratin protein will smooth and fortify your strands with a healthy glow in this shampoo. With organic avocado oils and cocoa butter to smooth the cuticle, it will rid your tresses of frizz and leave your hair shiny and strong. 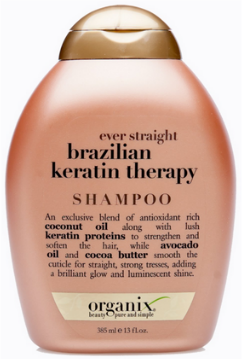 Formulated to work with the Brazilian Keratin Treatment, this shampoo deeply cleans your hair to remove all build-up to leave you ready for the treatment. This shampoo does not contain sodium chloride and can be used on all hair types. This shampoo will preserve your hair’s color while preventing breakage and sun damage. Not only is this product sulfate-free, sodium-chloride free, and paraben-free, but it will restore elasticity to your strands while the infused keratin blocks the humidity. This gentle cleanser washes away residue and impurities without stripping your strands of moisture or color. KeratinPerfect enhanced shampoo will restore the keratin and nutrients in your tresses while fighting frizz to give you smooth, shiny hair. The Suave Keratin Infusion Shampoo may be a bargain but it still provides a gentle cleansing while infusing keratin inside the hair fiber. This lower sulfate shampoo will provide lasting smoothness and keep your color vibrant while blocking frizz. Created for thinning, fine hair, this volumizing shampoo will gently but effectively clean your hair and nourish the follicles. Sulfate-free and fortified with keratin and panthenol, your hair will be ultra-clean, smoother, and stronger. Here is another gentle cleanser that nourishes dry, damaged hair. 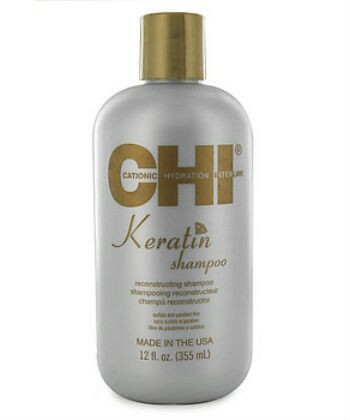 The keratin amino acids provide long-lasting strength and will give your hair touchable softness and shine. This sulfate-free shampoo is armed with keratin to penetrate and smooth the hair shaft while giving your strands strength and elasticity. The shampoo in this duo will protect and strengthen your hair while extending the life of your keratin treatment. 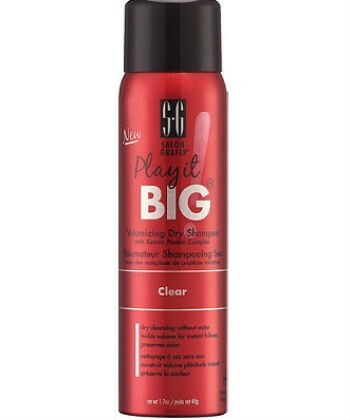 It adds sine and protects your color while smoothing away frizzy, unruly hair. Hair is instantly transformed from weak, abused tresses to strong, healthy, and smooth curls worth being proud of. The combination of keratin, jojoba oil, and argan oil along with a new Keratrix technology will give you all day protection and prevents future breakage. This shampoo has a triple threat of the keratin, argan oil, and amla oil that delivers hydration to your strands and scalp. The sulfate-free formula is gentle but provides effective cleansing. Your strands will be treated for the dryness and damage that color-treated hair can sometimes suffer from. If straight, smooth strands are your desire, then this shampoo will leave your hair sleek and shiny. Your curls will transformation from frizzy, dry hair to soft, smooth tresses with its lower-sulfate keratin infused properties. Ulta’s keratin infused shampoo is sulfate and paraben-free. The keratin provides the smoothness while sealing and protecting your strand from heat. This shampoo will protect your color and maintain its vibrancy. You get a no-frizz finish with this definer that holds your curls and your style for days. This creates optimum wash and go styling and it’s great for any hair length. 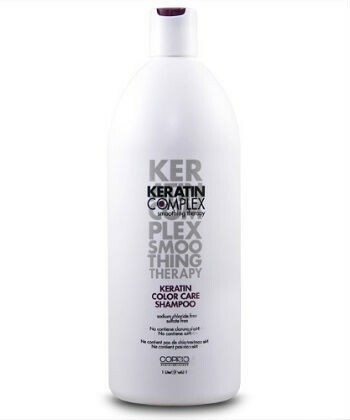 Miracle Keratin shampoo protects your strands with keratin proteins without the use of sulfates. It’s safe for all hair types and will leave your tresses smooth and shiny.